The Connection property of the class EleWise.ELMA.Extensions.Oracle.OracleTransformationProvider returns EleWise.ELMA.Runtime.Db.Proxies.DbConnectionProxy instead of connection of the Oracle provider. If a script is executed when changing the value of an integer or fraction, when specifying a more precise value than defined in the property settings (entering a fraction in an integer field), it will receive a rounded up value according to the settings. Now the notification about a new periodic event contains a correct link to the event template. Added verification of class and database table names on the form for creating a new process in Designer. The IDs in these fields must start with a Latin letter, followed by numbers, Latin letters or underscores "_". In addition, C# keywords are forbidden in class names, and keywords of the DBMS used are forbidden in database table names. When creating a process, you could specify any symbols in the class name and database table name of different process structures. There was no verification and no error message was displayed, while the process was saved. However, it was impossible to publish such a process later and the class name could not have been changed in Designer. Class and database table names are verified when creating a new process and error messages are shown. Views for displaying separate Emails and Phones were added (not as a list). Views for displaying Email and Phone lists were modified. 2. The functions EleWise.ELMA.Tasks.Notifications.TaskTemplateGeneratorFunctions.HtmlString and EleWise.ELMA.Messaging.SMS.Notifications.SmsTemplateGeneratorFunctions.StringCut were moved to the standard template generation functions EleWise.TemplateGenerator.Function.DefaultFunctions. 3. Class EleWise.ELMA.Messaging.SMS.Notifications.SmsTemplateGeneratorFunctions was deleted. When editing portlet pages, users, who have permissions to edit, can now switch to editing general settings. Configuring access to a page is available only if the user has full access to the page and when editing general settings. Possibility to select users (executor/co-executor/supervisor) for project tasks when publishing a project plan. In case when a project role with more than one user was selected in a plan task, the system used to suggest selecting a specific user each time when publishing the plan. 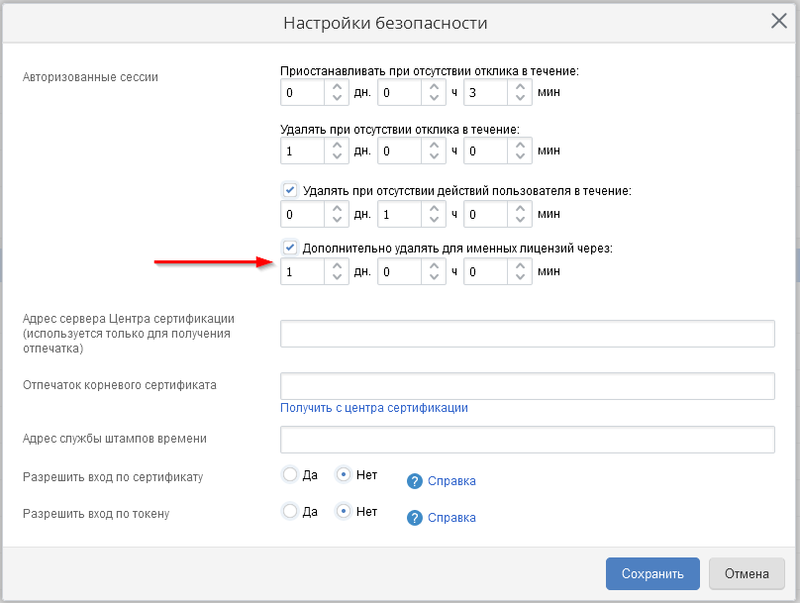 Now you do not select users for completed tasks and the tasks for which a user had been selected during previous publications. 1. SvcUtilPath (path to the SvcUtil utility) will be used in most cases. The file must contain a local path to SvcUtil.exe. Fill in these fields only if the supplied SvcUtil version does not work. If the SvcUtil parameter is empty or the file is not found in the specified path, the supplied SvcUtil version is started. 1. In the class EleWise.ELMA.Documents.Managers.AcquaintanceTaskGroupManager methods AddExecuters were marked as obsolete; instead, use AddSwimlaneExecuters. 2. In the class EleWise.ELMA.Documents.Managers.ApprovementTaskGroupManager methods AddExecuters were marked as obsolete; instead, use AddSwimlaneExecuters. 3. In the class EleWise.ELMA.Security.Managers.ReplacementManager methods AddUserToList and GetExecutor were marked as obsolete; instead, use AddUserToList<T> and GetExecutor<T>. 4. In the class EleWise.ELMA.Workflow.BPMN.Diagrams.Activities.BPMNActivity<TElement> methods Pair<IUser, IUser> GetExecutors were marked as obsolete; instead, use IUser GetSwimlaneExecutors. Methods AddUserToList were marked as obsolete; instead, use AddSwimlaneUserToList with different sets of parameters. Method Pair<IUser, IUser> IActivityWithExceptionFlowsImpl.GetExecutors was marked as obsolete; instead, use IUser IActivityWithExceptionFlowsImpl.GetSwimlaneExecutors. 5. In the interface EleWise.ELMA.Workflow.BPMN.Diagrams.Activities.IBPMNActivity methods Pair<IUser, IUser> GetExecutors were marked as obsolete. Methods IUser GetSwimlaneExecutors(IWorkflowInstance instance) and IUser GetSwimlaneExecutors(IWorkflowInstance instance, out bool assignedToResponsible) were added. 6. In the interface EleWise.ELMA.Workflow.Diagrams.Activities. IActivityWithExceptionFlowsImpl method Pair<IUser, IUser> GetExecutors was marked as obsolete. Method IUser GetSwimlaneExecutors(NativeActivityContext context, out bool assignedToResponsible) was added. 7. The extension point ISwimlaneChangedHandler were marked as obsolete; instead, use ISwimlaneChangedExecHandler. Default sorting setting was added for the list of linked objects. When configuring this element in the form builder, you can select one of the displayed columns and specify a sorting direction. 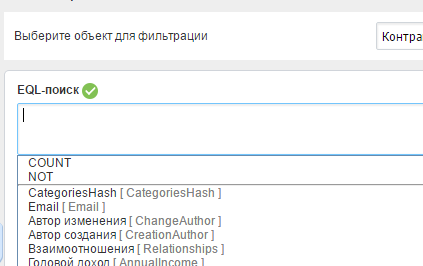 After publishing the object (process/document type/project type), which uses a form with changed settings of the list of linked objects, users will see the new settings in Web Application (all the user settings of this list will be reset to the ones, configured in the form builder in Designer). 1. The “Do not validate required fields” box was removed from the Create Document activity. 2. A separate log file for script execution data was added. The new log files are in web\logs\ScriptLog. This property indicates, that after saving the file to the database, the physical source file must be deleted; true is automatically assigned to this property when the InitializeContentFilePath method is invoked; false is assigned when a new value is assigned to the ContentFilePath property. Clearing of the folder for storing temporary ELMA files was added; all the files, created more than 24 hours ago will be automatically deleted. 1. In the interface EleWise.ELMA.BPM.Web.Common.Controllers. IFilterController method was changed FilterFields: parameter string filterGridId = "" was added. 2. Unique ids of objects and scripts were added to the html markup of the filter form. Only task executors and their superiors can reassign a task (reassigning is not forbidden in the process). The process initiator, who is the task author, does not have this permission. 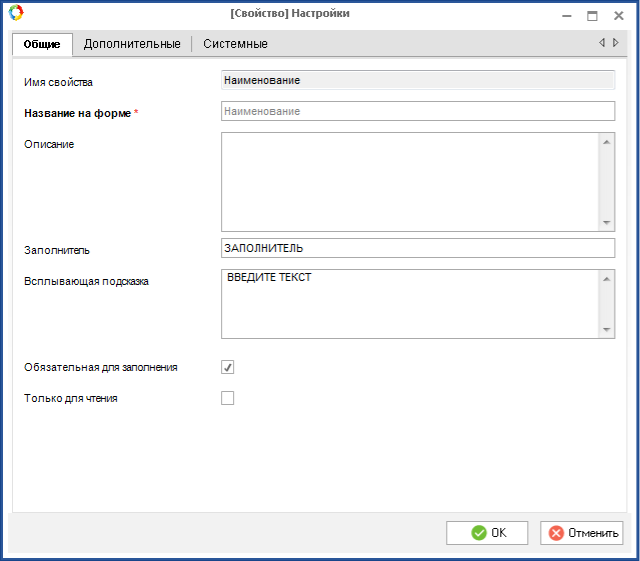 Manual and automatic synchronization of users imported from LDAP with automatic locking (according to the condition, specified in the import/synchronization filter) of ELMA users was implemented. In the LDAP module settings, you can enable/disable automatic synchronization and start manual synchronization. Parent tasks are now displayed differently, depending on whether it is a stage task or not. · Text formatting in the Task Description field fixed. · Possibility to combine cells in a column for single objects (only header, only editing field, etc.) was added. · Possibility to hide the block header or the grid header for tables with configurable column width was added. Plugin version field was added to the About Program window, displaying the current version of the plugin. If the plugin and server versions do not match, the user will see a respective notification in the About Program window. Possibility to change the designer/web server/package manager folder was implemented. To activate the respective buttons, run Visual Studio as the administrator. 2. Transfer of document groups was added for document type export/import. The service category “No category” for Contractors and Leads was returned to CRM. Algorithm: If the “Inherit from categories” box is selected and no category is assigned for a Contractor (Lead), then the “No category” permissions are automatically added to the “Inherited permissions” section. All the elements, available for tasks (including Time report log tab and time report list) were added to the form builder for process tasks. Unnecessary elements were removed from the form builder for process start, such as Transition buttons, Process information and Process context properties container. Text overlay in the logo of diagrams exported as images was removed; the text is now localizable. · When creating a sub-task with several executors, one entry with all the created tasks is added to the history. · Creating overdue sub-tasks is forbidden. Description of parameters that allow configuring the application was added in the Settings.config file. Description was added both for default parameters and for situational (hidden) parameters. 1. Method EleWise.ELMA.KPI.Managers.SmartTaskManager.CheckTaskExpiration(DateTime checkTime) was marked as obsolete. 2. Extension point EleWise.ELMA.BPM.Web.Common.ExtensionPoints. IFilterPortletGridId was marked as outdated. In the outgoing mail settings in the administration section, the Use SSL property was replaced with the new Connection Protection property, which has three values: No, SSL, TLS. When loading settings from a database, the old parameters are automatically converted to the new: if No is selected in the Use SSL field, then No will be selected in the Connection Protection field. Otherwise, the value will be selected depending on the value of the Port for Sending Messages field. Possibility to hide the icon for creating object on process task/object forms was added. After selecting this option on the form (in Designer), the icon will be hidden both in the Designer and on the form in Web Application after publishing the object. Important: the object creation icon will be hidden for all the child object, but you can change it for each particular child object. Now the image of the exported diagram contains the name in the header. Option for interrupting child processes in case of multiple operation start was added. Now you can view subscribers by clicking Actions – View Subscriptions on the document page. · FormView GetFormView(IElementWithView element, IWorkflowTaskBase task) – get the element form. Base realization of this extension point was implemented – BaseFormViewTransformation, which is executed for all the process task types and returns element.View, if no other realization was found. 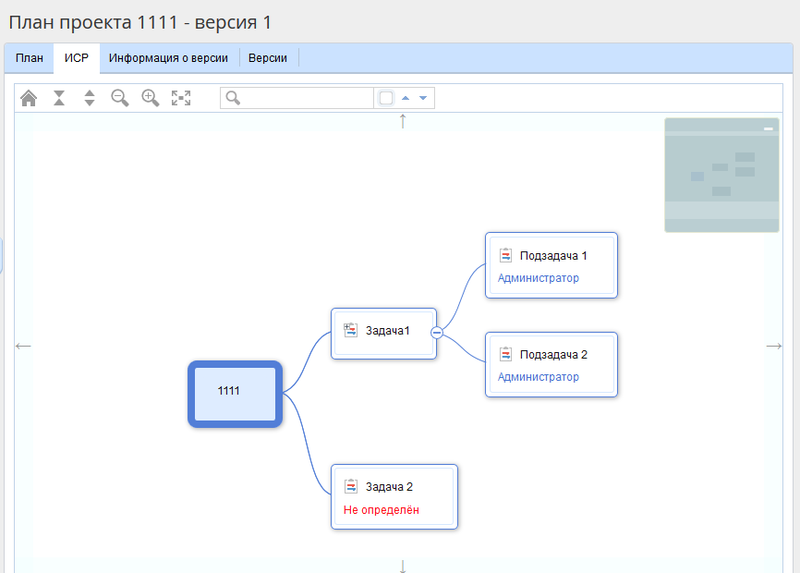 To child classes were implemented: UserTaskViewTransformation and DocflowViewTaskTransformation for process tasks and document tasks. Debugging of custom activities was added (similar to process script debugging). It is available only after publishing the custom activity. Method LoadMetadata(string filename, bool throwEx) was added to MetadataSerializer. If the metadata are not found in the file, then depending on throwEx null (throwEx == false) or error (throwEx == true) will be returned. Three methods were added in the interface IElementWithExceptionFlows: CanHandleException, QueueExecutionTimeoutSupported and GetQueueExecutionTimeout. In the class ActivityExceptionFlowHelper method Execute was marked as obsolete. When converting a lead, it is now possible to create neither a deal nor a relationship. When choosing to create a deal or a lead, required fields on the form are validated. Possibility to configure CallerId for each user, if using Asterisk. Possibility to create ELMA Entity in the ELMA plugin for Visual Studio was removed. Possibility to edit exiting ELMA Entity remains. ELMA plugin now supports Visual Studio 2015. 1. Possibility to insert images to email signature was added. In the settings, you can select what signature will be used for system emails: simple or HTML. You can add markup and images to an HTML signature. 2. Links to external and internal sub-process instances were added to the process instance map. Links to the parent process instance were added to the sub-process instance map. 4. GetRanges(string rangesHeader, long fileLength, out long RangesStartIndexes, out long RangesEndIndexes) were marked as obsolete, the code of these methods was moved to the class EleWise.ELMA.Web.Service.FileUpDownHelper. Class EleWise.ELMA.Files.RangeStreamWrapper was transferred from version 3.10. 2. Behavior of the "Do not validate required fields" option was changed – validation is disabled only for context variables, for other variables on the form, validation remains. Additional EQL filter applied to a property with documents also filters recently used documents. When selecting users from a user group, locked users are excluded. If you select a department in the organizational structure field when searching users, then the search result will display all the employees of the department and subordinate units. 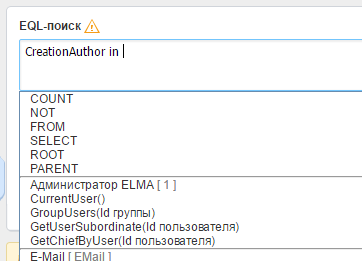 In Administration, the user filter has a parameter, indicating that only users included in the department (without subordinate units) should be searched. When configuring processes in the sales funnel, you can also select the processes, that the current user cannot start. The height of text fields in the web interface can be changed when entering data. You can configure display of nested object properties in blocks; they will be displayed in the list of entries. 1. Report cache FastReport EleWise.ELMA.Reports.Services. FastReportRunCache was removed. 2. System reports are published automatically after the import. 1. Restriction on naming table columns user properties of metadata (Uid and TypeUid) was added. 1. PublicAPI autocomplete was added in the scripts module. 2. Web service link generation mechanism was changed. 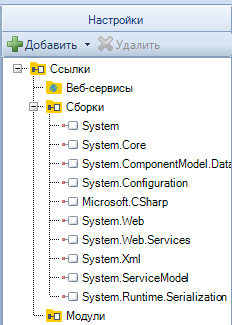 The new mechanism is similar to adding web services in Visual Studio. Generation with the old method is also available. 1. 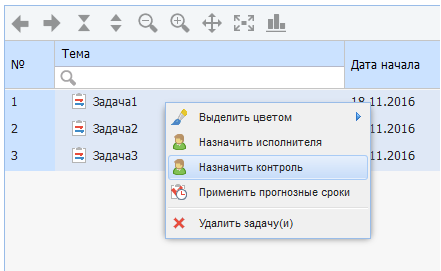 Possibility to assign control to a group of users in a project plan was added. 2. The Subtasks tab of project tasks displays subtasks of outdated and unpublished plan versions with the “outdated plan” label. 3. On a project task page it is possible to specify expected start date, due date and time report. 4.1. 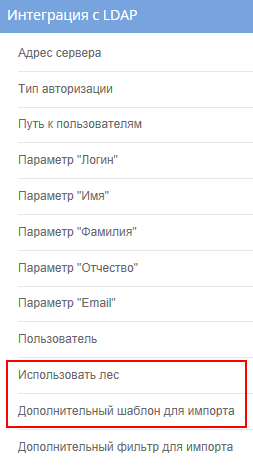 Drop down list. 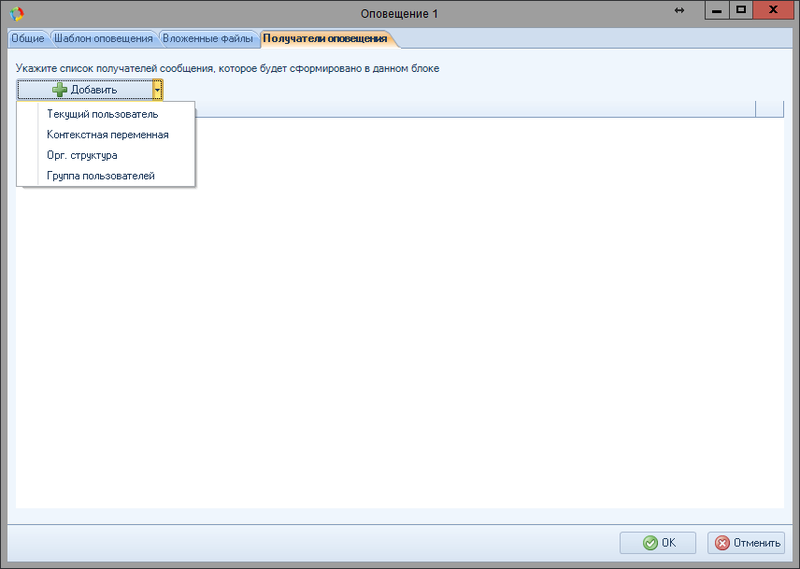 Display of users, assign to a job position was added; the number of users is also displayed if there are more than one (option in the property settings). 4.2 Search form. 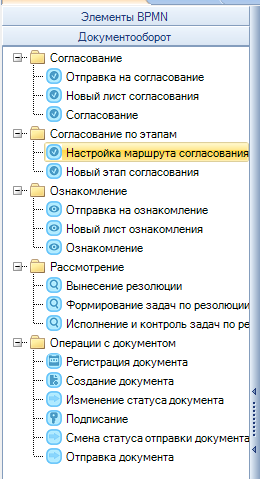 Hierarchy display was added when clicking on the organizational structure icon. 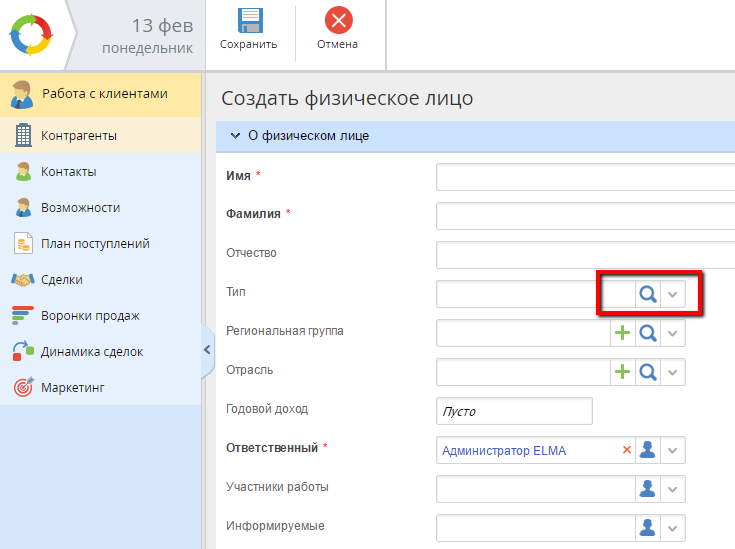 Obsolete property was added to the interface EleWise.ELMA.Projects.Models.IProjectTaskBase, which indicates that a task does not pertain to the current plan version. 1. Export of data from objects marked as not participating in data export/import is forbidden. 2. Import of data, whose metadata is marked as not participating in export/import is forbidden. Now, if data export is forbidden for an object, the checkbox is replaced with an icon with a tooltip. Due to disabling of NPAPI in Chrome, the Rutoken integration code was rewritten to asynchronous calls. Possibility to configure the color theme of ELMA web interface was added. If you have activation with concurrent licenses, a separate timeout parameter for named licenses is available in Administration. This parameter sums up the timeout with the main setting. If the timeout is not defined, then the session of named licenses will not be complete. When you select a user in a filter, the locked users are displayed separately at the bottom of the list; the search window displays users alphabetically with lock icons. Form builder was implemented for the Contact object in the CRM module. You can configure the view, create and edit forms, and details on a contact of a company. When filling in the Approval route object, you can select a user group or an organizational structure element as approvers of a stage. First Response box was added. I.e. if when bridging a non-sip or non-pjsip channel is used and the other channel belongs to an ELMA user, then the call page with the number located in callerId of the first channel will be displayed for the user. This situation may occur if the call is first received by the secretary. Overload was added for the method GetEntityActions(EntityMetadata metadata, bool inherit, bool onlyBase, bool loadextensions) in MetadataLoader. It allows getting actions of an entity with regard to extensions. When adding a File type (binary file) field to an object filter in Web Application, you can enter the ID of the searched file in the text field. If you specify an incorrect ID, search will not show any results. When copying forms in the form builder, all the razor views, which are used in this form, are copied locally for the object to a new form. When copying a child form to another child form, only the views that are configured in the source form are copied. 1. If an action cannot be performed, then the server returns an HTTP error with the 409 Conflict code. 2. Data transfer method from POST to GET of the Messages module for the method /Posts/GetMyFavorite was changed. Portlet template localization. When you create a portlet in a custom module using the plugin, all the text, used in the portlet template will be in the language, used in Visual Studio. 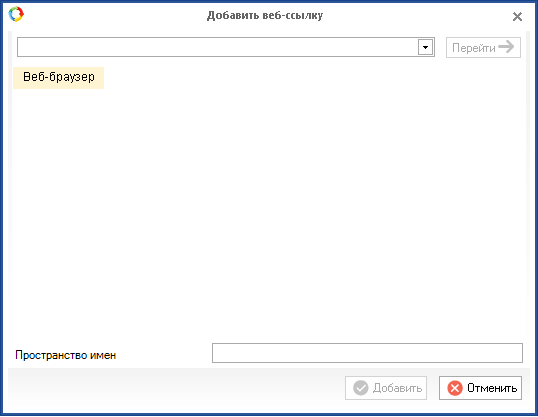 The portlet template is available in English and Russian. When you change the language of Visual Studio, the language of the created portlet will not change; for this, you need to create a new one. 2. Logger of the class EleWise.ELMA.CRM.Telephony.Managers.TelephonyManager was changed. Instead of public static log4net.ILog telephonyLog, public static readonly EleWise.ELMA.Logging.ILogger TelephonyLog is used. 3. Logger of the class EleWise.ELMA.Integration1C.Data.CProvider was changed. Instead of protected static log4net.ILog integrationLog, protected static readonly EleWise.ELMA.Logging.ILogger IntegrationLog is used. 4. Logger of the class EleWise.ELMA.Integration1C.Listeners.Connection1CScheduler was changed. Instead of protected static log4net.ILog integrationLog, protected static readonly EleWise.ELMA.Logging.ILogger IntegrationLog is used. 5. Logger of the class EleWise.ELMA.Integration1C.V77.CDocument77 was changed. Instead of protected static log4net.ILog integrationLog, protected static readonly EleWise.ELMA.Logging.ILogger IntegrationLog is used. 6. Logger of the class EleWise.ELMA.Integration1C.V77.CHelper77 was changed. Instead of protected static log4net.ILog integrationLog, protected static readonly EleWise.ELMA.Logging.ILogger IntegrationLog is used. 7. Logger of the class EleWise.ELMA.Integration1C.V81.CDocument81 was changed. Instead of protected static log4net.ILog integrationLog, protected static readonly EleWise.ELMA.Logging.ILogger IntegrationLog is used. 8. Logger of the class EleWise.ELMA.Integration1C.V81.CProvider81 was deleted. Instead of protected static log4net.ILog integrationLog, protected static readonly EleWise.ELMA.Logging.ILogger IntegrationLog of its base class EleWise.ELMA.Integration1C.Data.CProvider is used. 9. Logger of the class EleWise.ELMA.Integration1C.Integration1CService was changed. Instead of protected static log4net.ILog integrationLog, protected static readonly EleWise.ELMA.Logging.ILogger IntegrationLog is used. 10. Logger of the class EleWise.ELMA.Messages.Impl.TransactionalMessageManager was changed. Instead of public static log4net.ILog MessagesLog, public static readonly EleWise.ELMA.Logging.ILogger MessagesLog is used. 11. Logger of the class EleWise.ELMA.Tasks.Managers. SolveTaskHelper was changed. Instead of public static log4net.ILog SolveTaskLog, public static readonly EleWise.ELMA.Logging.ILogger SolveTaskLog is used. New property – Logger – was added to the base class for scripts of objects (including document and project types) and processes. It allows saving logs to a separate log-file (logs\scripts\sc-log-*). Outside the class with scripts for objects and processes (e.g. in global modules and in separate modules in VS) you can use the class EleWise.ELMA.Logging.ScriptLogger. After republishing an object, the structure Logger.Log.Error(...) will use the Logger property instead of the class EleWise.ELMA.Logging.Logger in all the object script classes, thus, the logs will be automatically written to the script log instead of the error logs. To achieve the same in processes, you need to recompile process scripts or publish the new process version for new instances. To write logs to a common file (e.g. errors log) use the structure Logging.Logger.Log (Logging.Logger.Log.Error(...)). Date/time [flow] class.method(:line number) - message. 2016-07-21 14:46:42,157  EleWise.ELMA.ConfigurationModel.Scripts.SpravochnikScripts.FormLoad(:26) - FormLoad1. 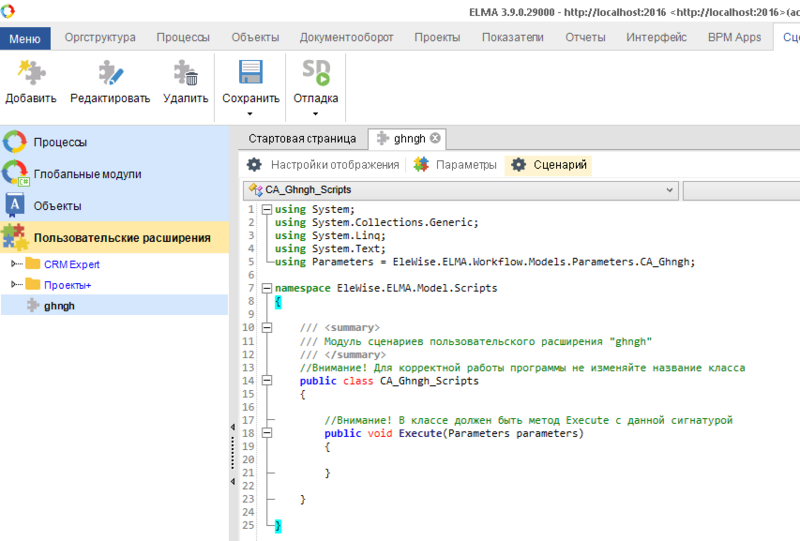 For correct output of the line number for object scripts, writing of debugging information file Web\App_Data\CompiledModel\EleWise.ELMA.ConfigurationModel.Scripts.pdb was added. Base forms were added to the Relationship object. Current forms of Relationship child objects were converted into base forms. 1. Algorithm for transferring local assemblies (connected in the object scripts module) from the source server to the recipient server was implemented. 2. When importing objects with global modules, a notification popup will appear. You should import global modules SEPARATELY. If you import objects with global modules to the recipient server without such global modules, import will be canceled with an error. Select icon was added. It is displayed inside the control. Properties AutocompleteComboBox: ShowComboBoxSelectIcon, ComboBoxSelectImageUrl, ComboBoxSelectOnClick. Add icon was added. It is displayed inside the control. Properties AutocompleteComboBox: ShowComboBoxAddIcon, ComboBoxAddImageUrl, ComboBoxAddOnClick. Clear field icon was added. Properties AutocompleteComboBox: ShowComboBoxDeleteIcon, ComboBoxDeleteImageUrl, ComboBoxDeleteOnClick. Possibility to use a template for displaying inside a control was added. Properties AutocompleteComboBox : UseTemplate , Template , TemplateJs ,TemplateOnLoad . For this, set UseTemplate = True, and pass the templates to the properties Template (display when rendering the control), TemplateJs (render the template when selecting an object). Edit field icon was added. Properties AutocompleteComboBox : ShowEditTemplateIcon , Template , EditTemplateImageUrl , EditTemplateOnClick . By default, when using a user template (UseTemplate) an object link is displayed, under the condition that the system managed to get the link; otherwise, text is displayed. All the object selection controls are set to the template display mode. External icons Select and Add are not displayed; internal icons are displayed. Possibility to specify task due date (if not specified, the fields will remain empty), when reassigning business process tasks, document tasks, etc. was added. When reassigning some task types (e.g. SMART-task), due dates cannot be changed: fields are unavailable on the form. Possibility to enter a name when creating/copying project plan or budget version was added. When adding a configuration in Designer, only remote connection to server is available now. Local connection to configuration is no longer supported. Graphic design of ELMA Designer was updated in this version. 1. Transfer of process policies was added. 2. Transfer of custom activities folders was added. 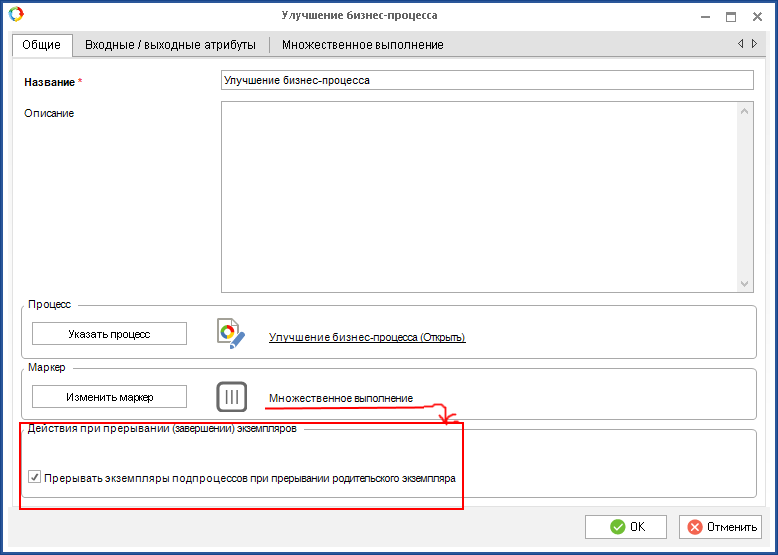 · method ExecPostSaveActions(IEntity entity, Type type, Dictionary<string, object> values, Dictionary<string, string> serviceData, List<LinksDictionaryItem> links) was replaced with method ExecPostSaveActions(IEntity entity, Type type, Dictionary<string, object> values, Dictionary<string, string> serviceData, LinksDictionary links). 2. Filling in the task subject with the name of the attached document. 3. 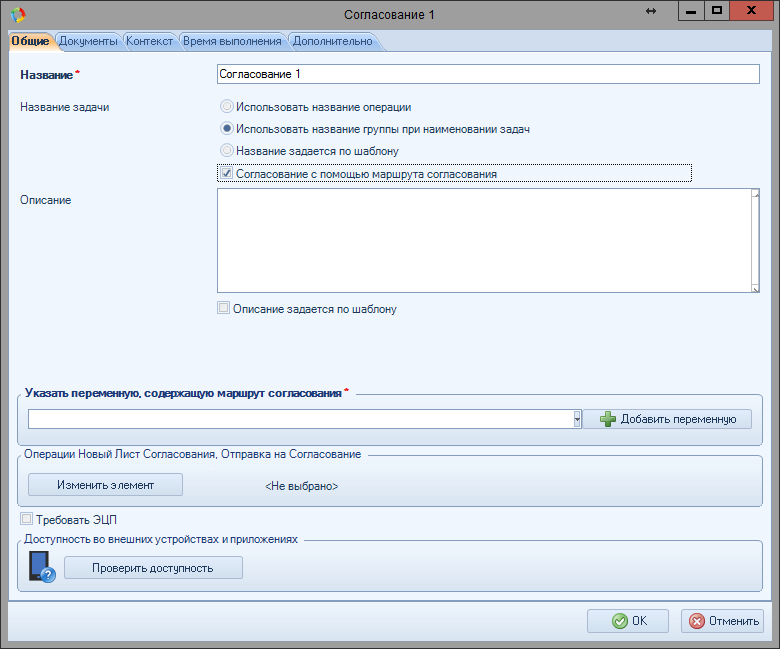 Processing of spaced in phone numbers. When making a call to a phone number with spaces, the spaces are skipped. 4. Possibility to show tasks for a longer period and display completed tasks in the Project Tasks from Me portlet was added (configured in the portlet settings). In some cases, the “Buttons for sending a comment” parameter may be reset. 1. ASP.NET MVC platform was updated from version 3 to version 4. To learn more, read this article. 2. NHibernate was updated to version 4.0. 3. ID generation mechanism was changed on MSSQL. Now stored procedures are used – alternatives of “generators”. 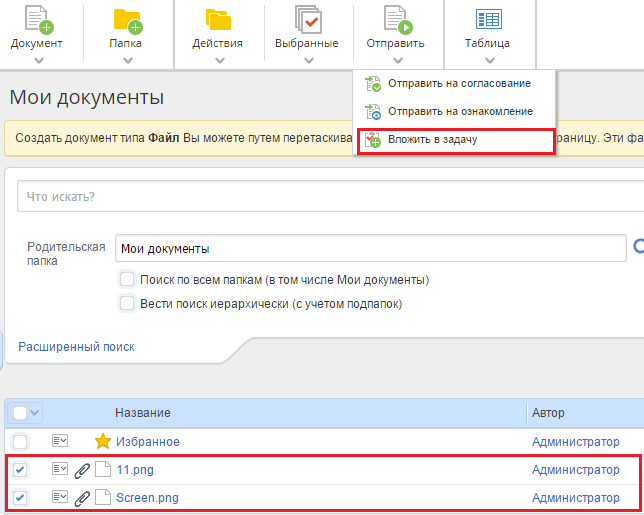 Now, when saving and object by using the Save method, it is added to the database only when confirming the transaction. o In the file ELMA\Web\Settings.config specify the “DbTransformCommandTimeout” parameter in seconds. We recommend setting more than required – 360000. Also check the file UserConfig\WebApplication\settings.config – if it contains this parameter, then set this value there as well. o In the file UserConfig\configuration.config find the tag <main connectionStringName="MainDB" … /> and add the commandTimeOut="360000" attribute, if there isn’t one. If it is there, set its value. o Update may take a very long time, which depends on the database size and database server resources. Our test show, that on average, a 100GB database on a server with 16GB RAM and quad-core 2.4GHz CPU is updated in 5-8 hours. o The Linked Server mechanism is also used for the MSSQL server. It allows isolating ID generation transactions from the main transaction. During the first start, the system will attempt to create a link point. 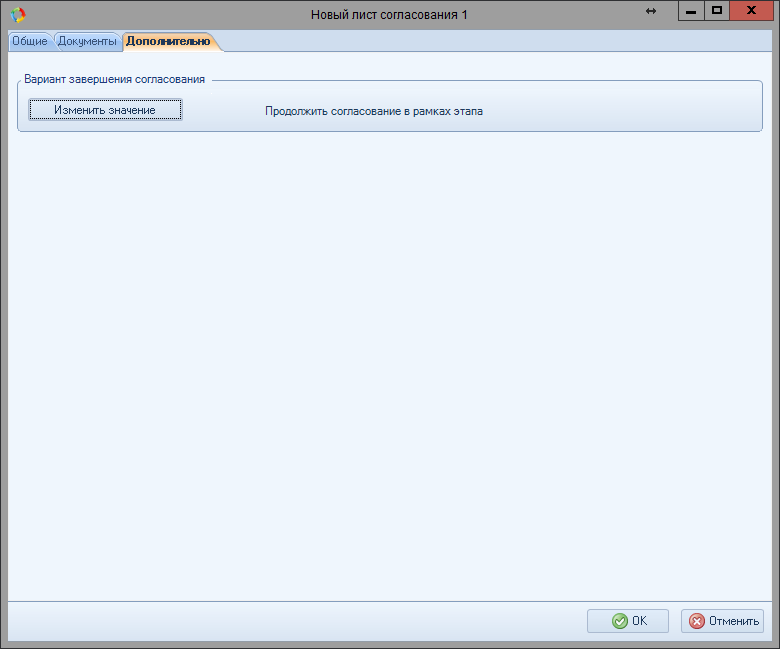 In case of a failure, instructions for the database administrator will be shown in Web Application. 4. Access permissions to a separate message were removed. 5. Possibility to archive Messages for a period was added. 6. 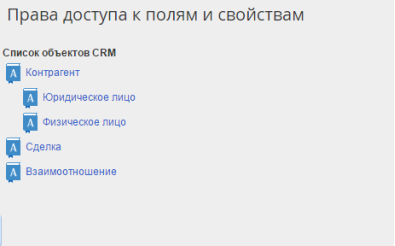 The system of CRM permissions was completely changed. 7. Permissions for creating CRM objects are now distinguished. 8. Full text index mechanism was improved and inbuilt Lucene.NET provider is used now. 9. [Projects] The revenue and expense item objects were moved to the common module. 10. Calendar events were modified to support the form builder. 11. Mail forms were modified to support the form builder. 12. Meeting forms were modified to support the form builder. 13. Call forms were modified to support the form builder. 14. EQL search of documents in filter folders was implemented. 15. 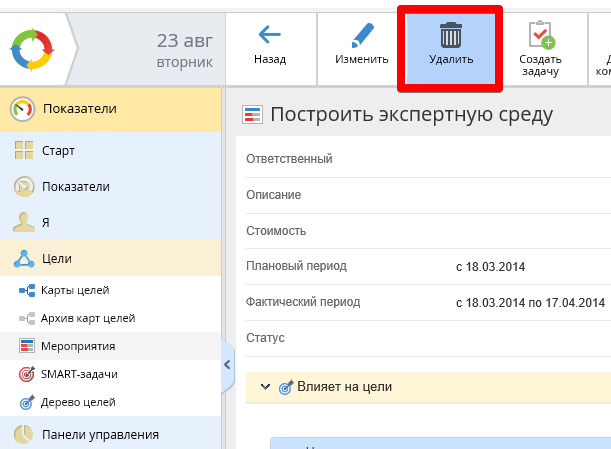 [Business processes] New activities for sending mail and SMS. 16. Security events registration for audit. o This is a separate module; it writes data to a separate database. 17. Routing process for a list of object instances. 18. Access settings on the level of object fields. o The software package still includes Firebird 2.5.
o You can deploy a new database on FB 3 or convert the existing one (description inside the task). 20. [Substitutions 2.0] Substitutions were improved (active tasks). 21. EQL check page for object type. 22. Project plan publishing significantly loads the server (up to stopping it). o Publication mechanism was completely changed; now it is asynchronous, i.e. it is executed on the server in the background mode. 1. Possibility to configure availability (hide, read, edit) of fields and properties for objects, based on a user, user group, organizational structure element or content of one of the properties (with a user, user group or organizational structure element). Thus, different users can see the same object differently. It is configured in Administration – Users – Access Settings – Objects. All the added and not configured fields are hidden by default. The fields marked with the icon, are the object name and are not hidden. 2. Possibility to configure availability (hide, read, edit) of fields and properties for CRM objects (Contractor, Deal, Relationship), based on a user, user group, organizational structure element or content of one of the properties (with a user, user group or organizational structure element). Thus, different users can see the same object differently. It is configured in Administration – CRM – Access to fields and properties. Access permissions are now assigned individually for each object and inherited by dependent objects. Regular and Required category concepts were removed. Global permission “Create Contractors” was divided into “Create Company” and “Create Individual” and so on for all the contractor’s heirs. In the Notification activity, the Notification Recipients tab was changed. Now you can specify a list that can include the current user, a context variable, an organizational structure element or a user group. New menu item was added in the Administration section – SMS Statistics. It opens the page for viewing the SMS statistics. The “Use Approval Route” box was added to the Approval activity if it is placed in a Business Role swimlane. If you check this box, the block for specifying a context variable for selecting approval executors becomes hidden and the block for selecting a context variable of the Configure Approval Route type becomes visible. The “Use Approval Route” box was added to the Common tab of the New Approval Sheet activity. If you check it, the Approval Type setting is hidden on the Advanced tab and one more approval result is added – Continue the approval procedure. Two new activities were added: Adjust Approval Route and New Approval Route. Helpers for editing and viewing an Adjust approval route entity were added. Interface was changed. Possibility to specify absolute time was added. In the form builder, two settings – hide empty read only properties and hide empty panels/tabs – were combined into one with the possibility to inherit values from the element’s container. 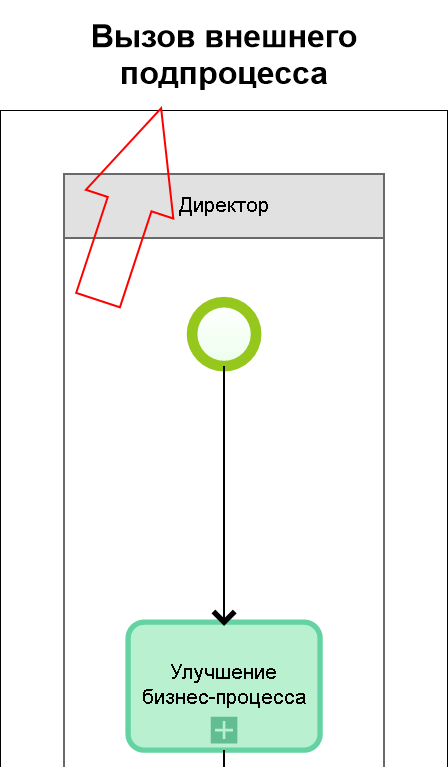 In the object menu, the column for selecting object element instances and the start process button were added only for the objects, for which a route is configured in Designer. When selecting one element in the list, only processes that had an input variable with the list and single link types could be started; when selecting several elements, only processes that had an input variable with the list link type could be started. 4. Possibility to configure task links by adding predecessors on the Gantt chart was added (“Predecessor” item of the context menu). 5. In the Calendar portlet, if the number of event participants is more than 6, they are displayed in an expandable panel. o manual – linked tasks are shifted freely, taking days off into account. o automatic – linked tasks are shifted according to the specified delay. You can set the planning type in the link editing menu or in the list of task predecessors. By default, all the links are now planned manually. Manually planned links are drawn in a stipple line. 7. Project plan publishing was changed. Publishing became more reliable, fail-safe, quick and informative. o Panel with information on the plan publication status. The panel is displayed above the project plan when starting publication and shows the currently executed action, progress, operation name and completion percent, publication error and restart button (if the user has project administration permissions and an error occurs). o Monitor of published project plans (the button for opening it is in the toolbar on the Projects page, which is available if you have full access to all projects). The monitor shows the list of project plans which are currently being published. All the publication data are in the table: start time, start author, completion percent and error (if any). o Automatic start of unfinished publications in case of sever restart. o Locking of operations that depend on the publication. All the dependent operations are locked if a project publication is active. The web part shows a notification about an active publication, and the scripts throw a EleWise.ELMA.Projects.Exceptions.PublishException exception and the operation is interrupted. A service was developed that allows starting processes based on the data from an xml file. The xml file can be created by two schemes: Strict and Custom. The Strict scheme provides validation of the imported values. The Custom scheme does not provide validation of passed values, however it allows importing more complex objects. The service is configured in its installation media. To configure the service without the installation media, edit the config file. 4. EQL search helper was improved. Now the helper allows creating nested queries. 5. Page for filtering any object types was added. 2. Window with information on the settings of debugging in Visual Studio was added to the Scripts section: processes, global modules. 5. Possibility to use method overloading when selecting a script was added (where selecting scripts is available). 6. Highlighting of syntax errors was added. Tooltips for syntax errors were added. Display of syntax errors on the scroll bar was added (with the possibility to click on an error to open it). Alt+PageUp and Alt+PageDown shortcuts were added to quickly switch to the next or previous syntax error. 7. Context menu was updated, two new shortcuts were added: format the selected text (Ctrl+I) and format the entire document (Ctrl+Shift+I). IMPORTANT!!! -> code formatting will not work if the document contains syntax errors. 8. Highlighting of parentheses, brackets and braces was added. 9. Support of regions and wrapped code was added. 10. Code auto-formatting was added (line breaks, margins, auto-closing of parentheses). 11. Warnings of missing comments were removed from compilation errors. 12. Support of web services with basic authentication was added. Progress bar when adding a web service was added (it is almost unnoticeable on light-weight web services). In version 3.9.0 two indexation providers are available: Lucene.Net 3.0.3 and ElasticSearch 1.7.3. Lucene is the default provider and is available in all the ELMA editions. It does not require installing an indexation server separately or configuring anything. ElasticSearch requires installing a separate indexation server and configuring connection to it. It is not available in the Express edition. In ELMA 3.9.0, ElasticSearch was updated; indexation requires server version 1.7.3. Older versions are not supported. If ELMA is installed with a new configuration and without previous installation, Lucene is installed as the indexation provider, and indexation of contractors and documents is enabled automatically. If you update ELMA from an earlier version and indexation is disabled, Lucene is installed as the indexation provider, and indexation is not enabled. If you update ELMA from an earlier version and indexation is enabled, ElasticSearch is installed as the indexation provider. During the first attempt to access the index, the indexation is stopped. To continue, you need to update the indexation server and restart the indexation. Lucene and ElasticSearch are available as the indexation providers. To start Lucene, you only need to select it. To start ElasticSearch, specify the indexation server address. If the server is unavailable or its version is not supported, you will not be able to start the indexation. Index Contractors setting enables/disables the indexation of contractors. When the indexation is enabled, the list of contractors and the contractor filtering result will be displayed by the index data. The search will be taking morphology into account. Index contractors’ attachments setting enables/disables the indexation of files attached to a contractor. The name and the content of the files is indexed. In case of attached documents, only the name is indexed. Morphology is taken into account during the search. When you enable this setting, the In Attachments setting appears in the contractor search interface. If contractor indexation is disabled, it does not work. Index documents setting enables/disables indexation of documents. 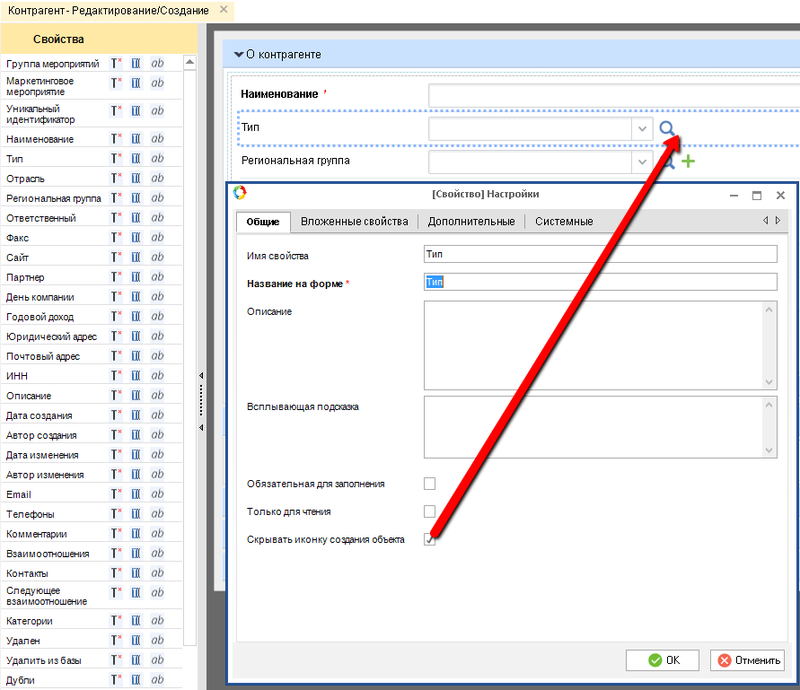 When indexation is enabled, the list of documents and the document filtering result is displayed by the index data. The search will be taking morphology into account. Index document versions setting enables/disables indexation of the current document version. Version file content is indexed. Does not work if document indexation is disabled. Indexation can be divided into two parts: index receives data and index returns data. To fill in the index, data are collected and passed to the indexation provider service, which in its turn passes them to the active indexation provider, which adds them to the index. To get data from the index, search by required criteria is requested from the indexation server. The received data are converted into either an object page or an object. During the indexation, an object is not passed to the indexation provider directly. Intermediate DTO is used for this (object page), which is a realization of the EleWise.ELMA.FullTextSearch.Model.IFullTextSearchObject interface heir. During the object indexation, only properties of the following types are passed to the index: yes / no, date / time, fraction, drop-down list, object, enumeration, GUID, HTML markup, integer (16 bit), integer (32 bit), integer, money, link to an object, string, text, time interval, URL, working time interval. Blocks and object block properties are not indexed. Some data types support not only search by full match (filtering), but also morphological search (extended quick search). The following types have this property: HTML markup, string, text, URL. The EleWise.ELMA.FullTextSearch.Services.FullTextSearchService service is used to invoke search in the index. It allows getting data from the index in one of the three methods. Count method returns the number of found object pages by the specified filtering conditions. Search and filtering is applied to both static and dynamic page properties. Find method returns the data of the found object properties by the specified filtering parameters. Used for dynamic search. Search method returns data on and highlights the found object pages by the specified search parameters. Used for static search. 1. Security events are registered in ELMA. They are stored in an external database. Microsoft SQL and Firebird are supported. 2. List of objects, whose events are registered, is defined in a separate configuration file with the .xml extension. 1. Multiline comment was added. 2. Tooltips for buttons were added. 4. When scanning, agent helps the user spot empty sheets and suggests deleting them. o It was possible to edit a signed document version vis Agent. 1. Support of the “Workflow.QueueEnabled=false” parameter was removed in the Settings.config file (when false, this setting used to allow executing business processes without the execution queue. 2. When a script is executed upon form loading, the changes in the context are not added to the database immediately after it is executed, but only after the task is completed or saved. 1. When activating the system with a limited period of use, the expiration date is now the same for all the system components (based on the platform expiration date). For ELMA filters, base interface IFilterBase was added. Now IFilter and IFilterDocumentFolder implement it. 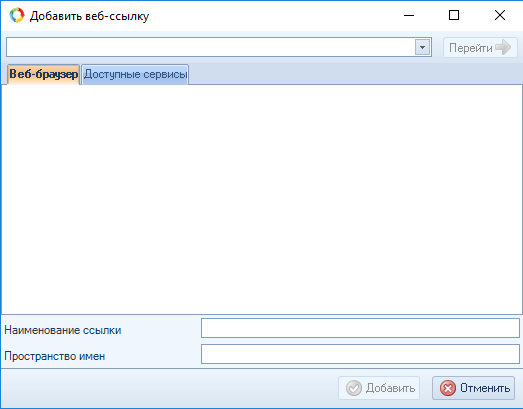 Controller FilterDocumentFolderController.cs and all its views (FilterDocumentFolder folder) were deleted from ECM. Instead, controller FilterDocumentController.cs was added. Filter folders now function on its basis. If some views were replaced for document filters, specifically in the FilterDocumentFolder folder, then they will not work in 3.9. You need to rewrite them. Document search form was deleted: DocumentSearchForm.cshtml . 2. Controller EleWise.ELMA.Messages.Web.Controllers.MessageController was deleted. Project templates in English were added (all the comments, object names, properties and actions were translated). A template in the required language will be used when creating a project depending on the language, specified in the Visual Studio settings. Fixed Visual Studio crashes when opening the Properties or Filter tab in an object.